Haley O’Brien, Legal Product & Partner Manager at Encompass looks at the challenges in search for Legal firms. Read the full article on Legal IT Insider, or download the PDF here. ‘Search and discovery’ lays the foundation of many legal cases with firms often spending days manually sifting through information from multiple sources to identify companies, people, properties and other assets of interest and then mapping how these inter-relate. The facts they uncover build their understanding of the case and shape their strategy. While search and discovery is an essential process it can be complex, costly and time-consuming creating delays of serious concern for any legal practice. Being slow to the facts inevitably means being slow to respond to client requests – slow turnarounds strain client relationships. Manual search is risky. It’s difficult to read through multiple files, cross-checking and analysing, and then documenting the facts. Errors arise when re-keying data during the iterative search processes – in some cases we have seen error rates as high as 20%. 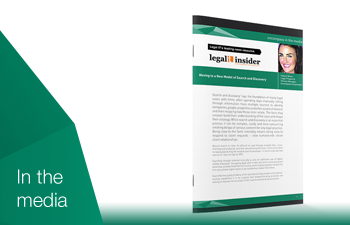 Read the full article on Legal IT Insider, or download the PDF here.